January 2015 n Performance & Hotrod Business n 47 LMC gets many orders for larger parts, such as hoods and fenders, and these are the more expensive parts that add quickly to the bottom line. Handling their deliv- ery in an efficient, damage-free way is very important, the company knows. Orders for the larger parts are put together in a different part of that ware- house. Some of the latest developments in packaging science allow big body panels to be shipped with far less chance of damage than ever before. Some of the new packag- ing materials used in place of foam-like filler are reusable. This helps keep costs down, so parts pricing can be managed better. 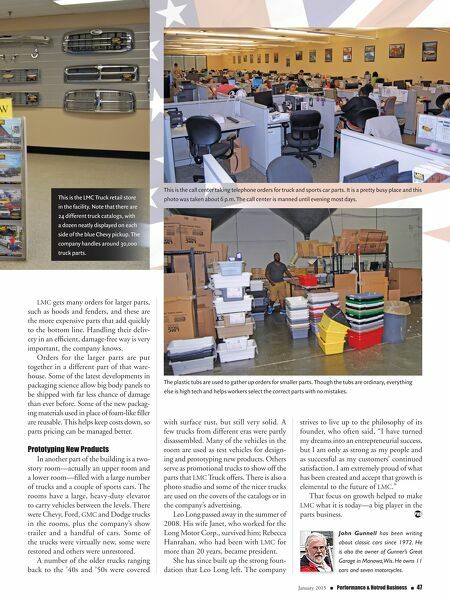 Prototyping New Products In another part of the building is a two- story room—actually an upper room and a lower room—filled with a large number of trucks and a couple of sports cars. The rooms have a large, heavy-duty elevator to carry vehicles between the levels. There were Chevy, Ford, GMC and Dodge trucks in the rooms, plus the company's show trailer and a handful of cars. Some of the trucks were virtually new, some were restored and others were unrestored. A number of the older trucks ranging back to the '40s and '50s were covered This is the LMC Truck retail store in the facility. 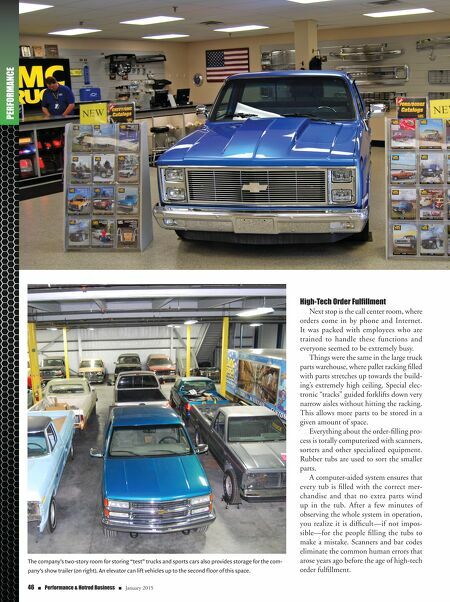 Note that there are 24 different truck catalogs, with a dozen neatly displayed on each side of the blue Chevy pickup. The company handles around 30,000 truck parts. This is the call center taking telephone orders for truck and sports car parts. It is a pretty busy place and this photo was taken about 6 p.m. The call center is manned until evening most days. with surface rust, but still very solid. A few trucks from different eras were partly disassembled. Many of the vehicles in the room are used as test vehicles for design- ing and prototyping new products. Others serve as promotional trucks to show off the parts that LMC Truck offers. There is also a photo studio and some of the nicer trucks are used on the covers of the catalogs or in the company's advertising. Leo Long passed away in the summer of 2008. His wife Janet, who worked for the Long Motor Corp., survived him; Rebecca Hanrahan, who had been with LMC for more than 20 years, became president. She has since built up the strong foun- dation that Leo Long left. The company strives to live up to the philosophy of its founder, who often said, "I have turned my dreams into an entrepreneurial success, but I am only as strong as my people and as successful as my customers' continued satisfaction. I am extremely proud of what has been created and accept that growth is elemental to the future of LMC." That focus on growth helped to make LMC what it is today—a big player in the parts business. John Gunnell has been writing about classic cars since 1972. He is also the owner of Gunner's Great Garage in Manawa, Wis. He owns 11 cars and seven motorcycles. The plastic tubs are used to gather up orders for smaller parts. Though the tubs are ordinary, everything else is high tech and helps workers select the correct parts with no mistakes.